Today I’m back with another crazy delicious recipe for you all! This time it’s beef barbacoa, and it’s done in the oven! 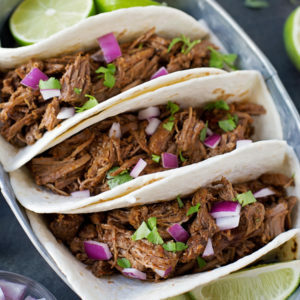 I’ve always been a sucker for Chipotle’s beef barbacoa, so I finally decided to make a homemade version. 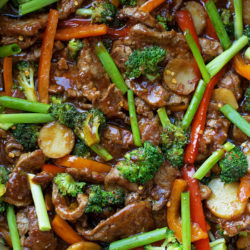 It’s so incredibly easy and it comes out tender, juicy and extremely flavorful. First, you’ll need a large piece of beef. I’m talking a 4-5 pound beef chuck-eye roast or shortribs (if you can find a roast), you know the ones that are nicely marbled with fat. Cut it into about 8 large chunks and then braise in an oiled Dutch oven set over medium-high heat. Why a Dutch oven? Because they’re perfect for braising and oven roasting meat. Their enameled surface lends to crispy exteriors and and easy release. Plus you can braise, simmer and transfer the pot directly to the oven. That’s huge. (I LOVE my Le Creusets and use them on a daily basis). If you don’t own one see my NOTES at the bottom of the recipe for an alternative method. Back to the recipe… braise the chunks on all sides, then transfer to a plate to rest. Meanwhile, in that same pot, saute the onion and garlic. Toss in the seasonings/spices and let ’em go until they’re fragrant. Toasting the spices adds a whole new level of flavor to the beef, and trust me, it’s worth it! Then whisk in a cup of chicken broth, scraping the bottom to remove any browned bits that formed earlier. Add in the braised beef chunks, the remaining chicken broth, minced chipotle chilies (so much flavor there), adobo sauce (it’s what the chipotle chilies come in), apple cider vinegar (just plug your nose and pour it in), Worcestershire sauce (more flavor), half a can of diced tomatoes with green chilies (don’t skip this ingredient), lime juice (need I say more?) and two bay leaves. Bring to a simmer, cover and then transfer to the oven. Bake at 325 degrees for 3-4 hours or until the meat is fork-tender. Just know that every oven and cooking vessel is different so the time will vary. The liquid will evaporate over time leaving just a tad bit at the bottom of the pot. That’s exactly what you want! Remove from the oven, return to the stovetop and reduce the liquid if you have a lot left. I didn’t have very much, so I only did this for a few minutes. You want there to be a little liquid in there, that way after you shred the meat you can toss it back in and let it absorb it (you may notice that mine looks a little dry, that’s because I was in a rush to take pictures and totally forgot to do that). Remove the bay leaves and serve while it’s still warm! 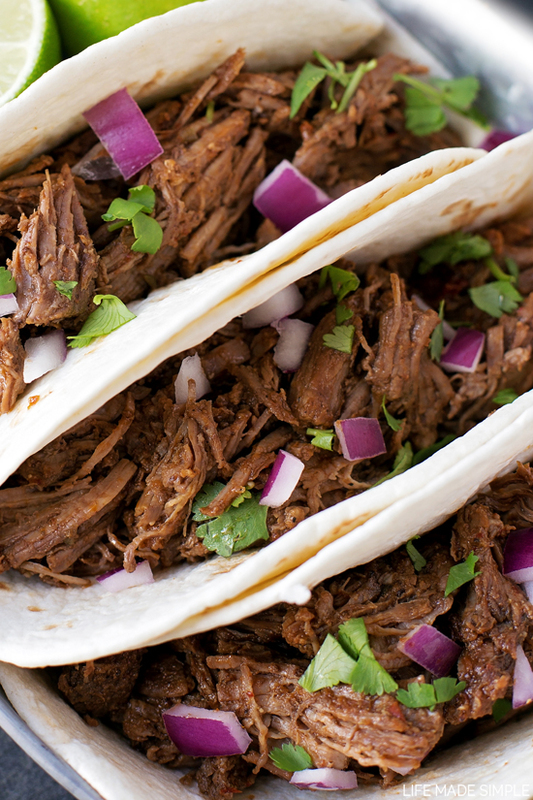 We made tacos with our barbacoa, but you could use it in burritos, enchiladas, quesadillas or on nachos. No matter how you serve it, I guarantee it’ll be crazy delicious! 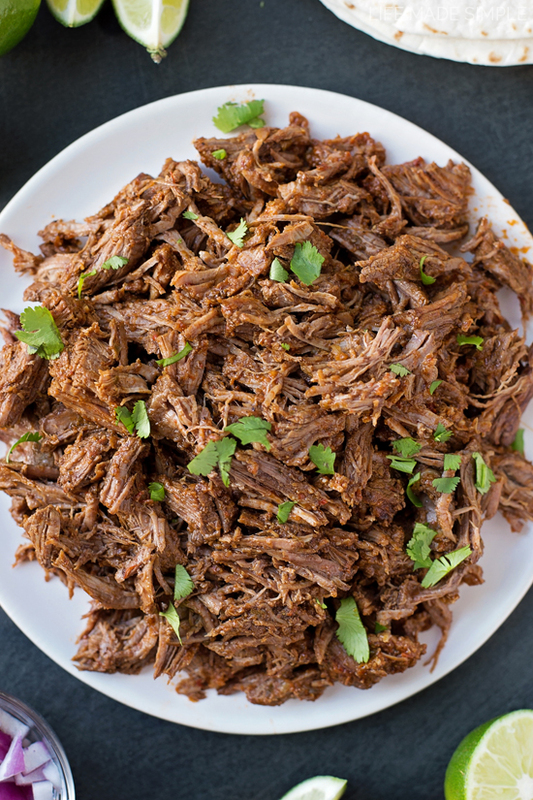 Our family fell in love with this beef barbacoa, I hope yours will too! 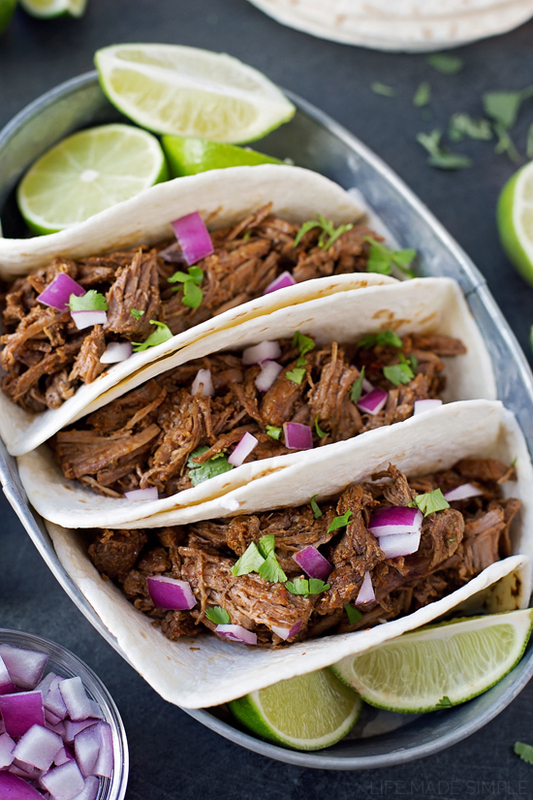 This crazy delicious beef barbacoa couldn't be easier to make! 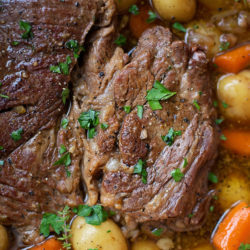 Season, braise, simmer and let your oven do the rest! Preheat oven to 325 degrees. Adjust oven rack to middle lower position (so that your pot fits). Cut the beef into about 8 large chunks. You'll want the beef to remain marbled with fat, but if there are giant spots, it's ok to remove them. In a large Dutch oven over medium-high heat, add the vegetable oil. When the oil is hot, add the pork and braise. When the meat is crispy and brown flip and continue to braise the other side (I let mine go for about 4 minutes on each side). Remove and set aside. Add the onion, garlic and seasonings to the pan. Allow the onions to cook until translucent and the spices to become fragrant. Scrape up any browned bits while whisking in 1 c. of chicken broth, then add in the meat. Pour the remaining chicken broth over top, along with the minced chipotle chilies, adobo sauce, apple cider vinegar, Worcestershire sauce, tomatoes with green chilies, lime juice and bay leaves. Bring the mixture to a boil over high heat, then place the lid on and transfer to the preheated oven. Let the beef cook for 3-4 hours, stirring twice during that time. The meat should fall apart and be extremely tender. Remove from the oven and if needed, place over medium-high heat to reduce the liquid (I only did this for a few minutes). Remove the meat and place on a large cutting board. Shred the meat with two forks, then return to the pot to absorb any of the leftover juices. Discard bay leaves and serve warm. -If you don't own a Dutch oven, simply do everything in a large pot, then transfer to a 9X13 ceramic or glass dish. Cover with foil and bake according to the directions. 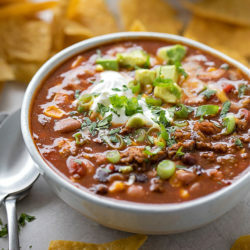 -You can find chipotle chilies in adobo sauce in the Latin isle of most grocery stores. This looks really good. Can this be modified to cook in a crock pot? I would love to set it and forget it in my slow cooker instead of having the oven on in the summertime. Thanks! Is the tomato amount half of a 10 oz can or half of a 20 oz and thereby i should add 10 oz? Same question here – our markets only sell 14oz cans. But I looked on Amazon and a 10 oz can is a thing, whereas a 20 oz can is not. So I’m using 5 oz (half a 10 oz can) on the theory that I can add more later, but I can’t take any out. 😉 Great recipe!